Everybody has a story. Most of the stories we want to hear are the ones with a happy ending, the stories where everything works out in the end. John David's story isn't like that. John David grew up in a very Christian environment. Church was a important part of his family life. He went to a Christian elementary school, was active in his youth group, went on mission trips and even served from time to time at his church. At the age of 17 John made a decision to completely surrender to Christ and dedicate his life to growing as a disciple. After high school he attended a Christian bible school in Texas and after graduating returned home to Alabama where he began serving in his local church. 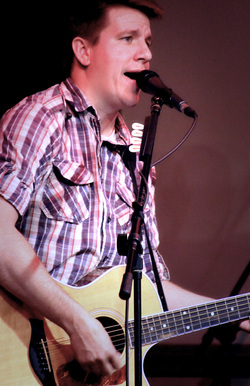 Songwriting became a passion and John began writing and encouraging the church in any venue he could with different bands. He served in many different roles in ministry as a worship leader, student Pastor and technical director for over 12 years in three different churches. As far as he knew, he was doing what he was supposed to do. He met his wife Jessica at one of the churches he served in and they married in 2005. In 2008 they had their first child, Noah. It seemed as if everything in his life was moving forward peacefully without any danger. But in 2009, his son Noah began showing signs that something wasn't right. He walked with a limp, ran into furniture and walls and was nauseated. On a Friday afternoon in November Noah was admitted to the hospital for fear of dehydration from being so sick. During the stay doctors ran multiple tests trying to discover the root of his problem. After all tests came back inconclusive, a CT scan was performed. In Noah's brain, a tumor was discovered growing out of control. It was the size of a man's fist. He was dying and they didn't even know it. Noah was airlifted to Childrens hospital in Birmingham, AL. and their fight with cancer began. Noah was 21 months old when the tumor was discovered. He underwent three major brain surgeries removing 1/6th of his brain. He suffered with three different chemo treatments at once for a period of ten months. He received the full dose of radiation allowed for a child his age for six weeks. He was a candidate for experimental treatments and received chemo drugs that were a last resort option. None of the treatments or surgeries worked to cure him of the cancer. In the month of April 2012, John and Jessica were told that all options had been exhausted and that no other treatment for Noah was available. Broken, they took Noah home and tried to make the best of the last moments they had with him. Through the entire ordeal, people surrounded them with love and support. Prayers were lifted up for Noah. Hands were laid on him by leaders of the church. Churches all over the area joined together in faith asking God for a miracle for Noah. Jessica and John David did everything that they knew to do in asking God to heal their son. Even when you try to do what's best, when you try to go down the right paths and serve in the places you feel called to serve - God still says no. Even when you pray with all the faith you can muster, you are wiling to make any deal with God and give up anything you have to receive a yes answer - God still says no. 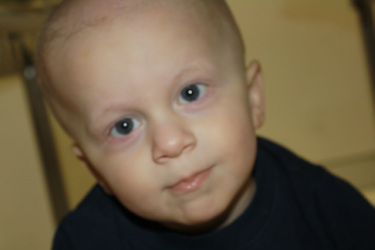 On May 18th, 2012 Noah Alexander Crowe lost his fight with cancer and went home. The Lord took him and he received his healing in heaven. What was left in the aftermath of the loss of their child were two parents with broken hearts. Their dream of having a healthy child faded with the last breath Noah took. Discouragement, frustration, anger, confusion and doubt tried its best to creep into their hearts. Thoughts of hopelessness, despair, suicide and turning away from God knocked at their door. Why would a loving God allow this to happen? "If God is so good, then why did my child suffer so much?" "If God is love then why didn't He love us enough to heal our son?" "If God is all powerful, why didn't He use His power to make this work out with a happy ending?" These questions ran through their minds for many days and months to follow. We've heard about God answering prayer. We have seen God answer prayer. We have experienced God saying yes to prayers. But the question in John David's and Jessica's mind was "God, why didn't you answer this prayer?" He never said He would make everything perfect. He never said we would always be safe from harm, trouble, disease or death. He simply said to trust in Him. John David's desire is to share the story of Gods comfort, His healing for the broken hearted and His provision through the story of Noah's life, death and the aftermath of his loss. The songs he has written these last few years will be a comfort to those who know similar pain and they will be an encouragement to those who may be on the verge of giving up or who already have given up on their relationship with God.